If You Like A Good Soak You Have Come To The Right Place! People today enjoy creating spaces in their homes which reflect their personalities. To help them design bathrooms the way they want, manufacturers of tubs have introduced some free standing bathtubs. These products are available in several styles ranging from old world to contemporary. A classic tub can be found as a pedestal style with the basin placed on a platform base. The entire piece is made of cast iron with a white enamel finish. This unit is available in both a single and double size and can be used as either a free-standing unit or as an installed piece. Compared to a standard bath, these contemporary free standing soaking tub are not particularly cheap bathtubs but are really beautiful and usually excellent quality so they can really set a bathroom off. 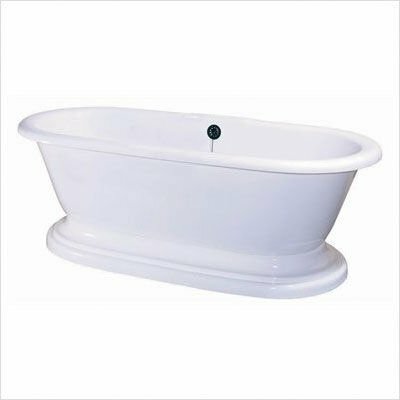 People who have old world themes can choose one of the Victorian style free standing soaking bathtubs. These are designed with one end made to be higher than the other. The high end acts as a backrest to allow people to lie back and relax while soaking in their tub. The base on this model is made using four small feet designed with ornate patterns on them. While the tub comes in the classic white color, the feet are often colored silver, gold or black. The soaking styles are also referred to as slipper tubs and can be found in a few different sizes. The modern designs of free standing bathtubs include several items inspired by styles from the orient. These can use blocks of wood as the feet or have an entire frame used to hold the tub. The framed items will use a rectangular shape to add contrast to the rounded corners of the bathtub. A frame can be made of metal or wood and is available in a few color options including black. Some other contemporary designs have the edge around the bathtub designed as a rectangular surface area, which extends an inch or two rather than the classic rolled design. Modern designs also incorporate additional features into the classic bathtub. The free standing whirlpool bathtubs come with jets placed inside to create a home spa experience. These freestanding bathtubs with jets are available in several styles including the modern framed design, the Victorian and the platform base. One basic design is available as a six foot tub made of acrylic and includes a total of fourteen jets on the entire piece. With price tags usually around the two thousand dollar mark, most models are not designed as cheap free standing bathtubs. However, they do allow people to create a room which reflects their personal style. If you are looking for cheap free standing tubs then check out Amazons prices by clicking the ‘click to check price’ button at the top of the page.